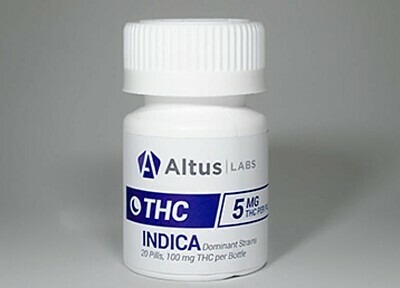 Altus Labs now offers THC Indica Pills infused with 100 mg of premium THC extract. One package contains 20 pills, each imbued with 5 mg of Indica-leaning THC. These pills are perfect for afternoon and evening use. Their potent contents unfurl a luxuriously euphoric sense of sedation that sweeps across your every inch to whisk you off into peaceful sleep. Each of these pills can secure a wonderful night's rest free of pain and anxiety and you'll wake up in the morning feeling refreshed and ready to go.